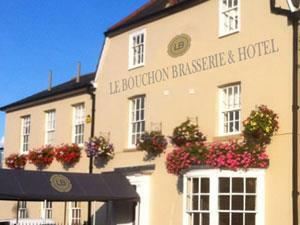 Le Bouchon Hotel & Brasserie01621 856511work01621 857842fax HotelRecent renovation works to the building combine original period features and furnishings with classically styled decoration that complements the building. Enjoy a meal from the A La Carte menu in the main restaurant or choose from the wide selection of menus available. Recent renovation works to the building combine original period features and furnishings with classically styled decoration that complements the building. Overnight guests can choose between hard or soft pillows, a duvet or blanket and a continental or full English breakfast. Set on the B1019, directly linked to the A12.